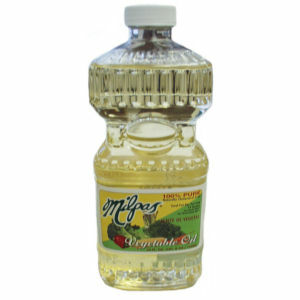 Our twenty four ounce Milpas Vegetable oil is 100% pure and naturally cholesterol free. It is 100% soy bean oil with no additives. Packed under the strictest quality standards to assure freshness. The attractive bottle is shaped in a contoured semi-rectangular shape with a special contour in the middle for easy handling. The product has an aluminum safety seal inside the lid to assure extra consumer safety. Milpas quality is guaranteed.